Today the council closed my school. Mummy says school has never been closed by snow since Marcel started school in 2002 so it must be cold. 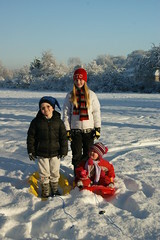 Mummy and Lots took Anna and I for a ride on our sledges. I even tried sledge surfing standing up - it was great fun. Afterwards we picked up Amaia and went by sledge to Granny and Pumpa's house where we had warm juice and played on Pumpa's organ. It was so much fun I didn't even miss school. Eh, could we maybe be a little more careful with our choice of words ,,, "We had warm juice playing on Pumpa's organ !!!"